Let’s dig deeper and provide you additional information on the Timberland PRO Men’s Endurance Pr 8” work boots. They’ve made it to our list of one of the best work boots available on the market today, now we are going to dive deeper into this particular style to let you know how they rate with us. Follow us as we roam down the trail of specific categories regarding these work boots and explain what they have to offer. At the end, we will provide a rating of safety, price, and comfort to better assist you in your choice. Furthermore, as a work boot, these would be beneficial for a welder, concrete worker, or construction engineer, as they provide that additional safety for these particular jobs. 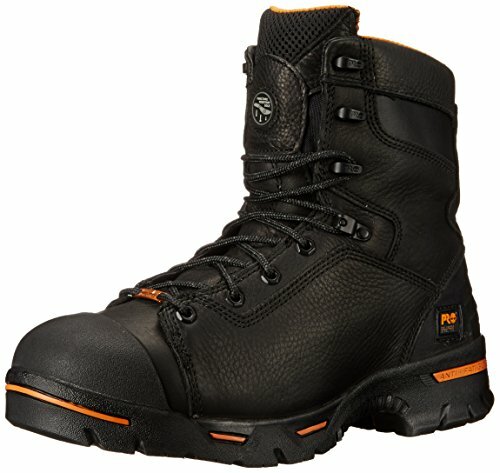 < img> If you’re in the market for a boot that offers ample protection on those hazardous job sites, these particular boots are equipped with a steel toe that’s ASTM-rated, Steel-Flex puncture-resistant plates that will protect your feet from sharp objects penetrating the boot and getting to your feet. 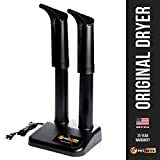 In addition, they offer electrical hazard protection, and the shock-resistant rubber outsoles protect you from slipping, heat, oil, chemicals, and abrasion. Plus, the ladder lock lugs provide aggressive traction so there isn’t any walking or stepping mishaps. Comfort is another key factor incorporated in these work boots. They are equipped with anti-fatigue technology and single density contouring footbeds with open cell polyurethane that provides softness. Plus, the mesh liner promotes airflow so your feet stay cool and dry. In addition, a thin, less bulky insulation is incorporated in these boots to keep your feet warm in colder temperatures. The fiberglass shank is also lightweight and comfortable but supports your foot adequately. For those who work in construction or who are on their feet all day working on concrete, the comfort level is high. The boot itself is constructed with a full grain leather upper, cement constructed soles which are flexible and supportive, polyurethane soles that are breathable, and rubber back stay that prevents scuffs and abrasions. Also featured in the material is an anti-microbial treatment that prevents odors and built up bacteria. These are also, lace up boots with dual-purpose top hardware for easy adjustment. As a completely waterproof boot, the Men’s Endurance features waterproof leather and a waterproof membrane that is designed to keep your feet dry even in standing water. The cement construction provides a stable foundation while sealing out water. It’s one of our top rated waterproof boots. These boots do tend to run tight so if you’re planning on wearing thicker than average socks, we would suggest a ½ size larger. In addition, they tend to feel heavier than a lot of work boots; however, the comfort provided makes up for the additional weight. Particularly, they are not designed for a wide foot, unless you compensate with a larger size. These boots offer the durability needed for tough working conditions like steel factories, auto shops, and manufacturing plants. The double toes offer an extra layer of abrasion resistant strength, plus the puncture resistant steel plates last and protect efficiently. As we mentioned the cement construction is designed to last for years. Timberland is known for using recycled and sustainable materials in their products. Of course, Timberland has been associated with manufacturing quality work boots for years and the PRO series is one of the best they have available as they began incorporating their comfort technology to keep you on your feet comfortably throughout those long days. Timberland has boots available for any job requirement, and specifically designed to meet those demanding requirements.